Do you need a third-party disk utility? When your Mac starts to go south, it helps to have software tools to fix the problems or to recover your data. Micromat’s TechTool has long been used for Mac troubleshooting, and the new TechTool Pro 7.0.1 has support for 64-bit architectures, Apple’s OS X Mavericks operating system, and a brand new test to diagnose RAM module problems. 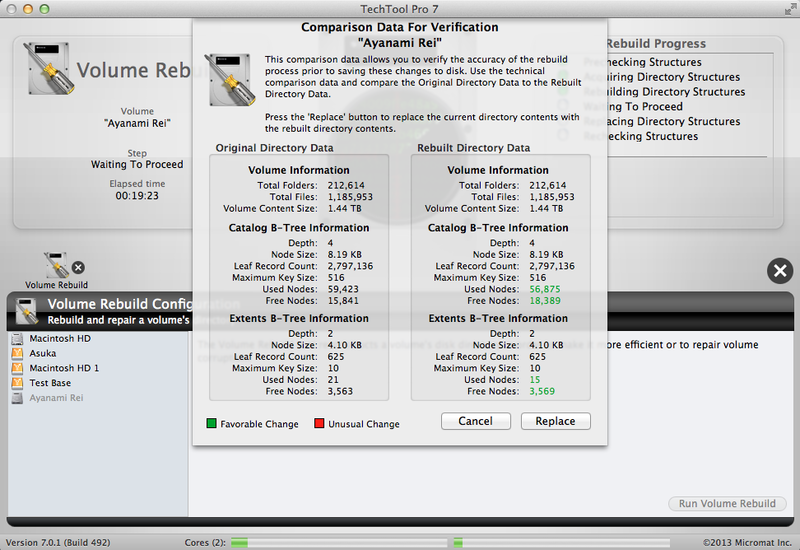 The Volume Rebuild tool allows you to see what changes will be made before you replace a directory. The new version, which retains the same look and user interface that Micromat revealed in version 5, sports three main sections; Tests, Tools, and Reports. The Tests section includes an overall computer scan, volume structure, file structure, and video memory utilities. The Tools section provides access to more specific utilities (such as volume rebuilding, disk optimization, audio and video utilities, and eDrive emergency partition creation). The Reports section allows you to see log files for past tests and group the results by category, such as All Jobs, Failed Jobs, etc. 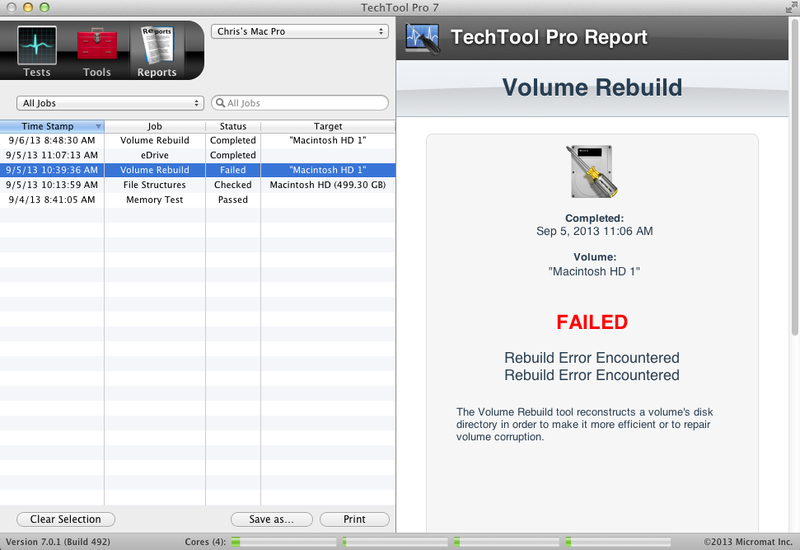 Where the guts of TechTool Pro 7 are concerned, the software holds up as admirably as it ever did. Open the application, select a hard drive or partition you want to take a look at, specify the test you want to run and the software sets to work, the gauge-driven user interface providing you with a decent estimation as to the progress made so far. Connect an external volume to your Mac and TechTool picks up on it fairly quickly, allowing you to run a full battery of tests on it as well as eject it from your Mac for safe removal. 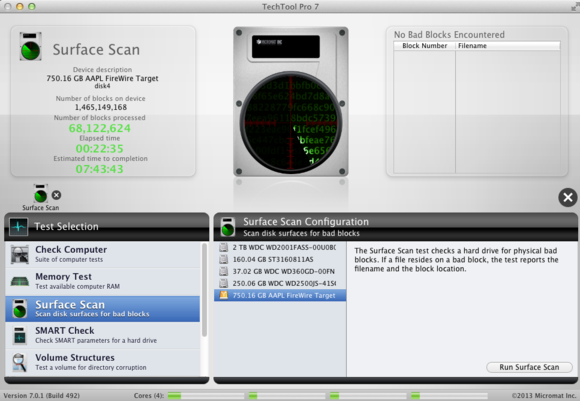 The Surface Scan tool lets you check for failed hard drive sectors before problems arise. It never hurts to have a backup partition on hand to boot from and TechTool Pro’s eDrive feature remains as strong as ever. Simply click into the Tools section, select to create an eDrive partition, enter your administrator password and the application creates the boot partition within a few minutes. Once created, this partition, which will occupy about 12GB of hard drive space, can be accessed by holding down the option key while booting your Mac, selecting the eDrive partition and starting from there. Upon booting into the eDrive, you have access to TechTool Pro’s robust battery of tests, which can help pin down problems with your main hard drive without needing to find the classic utility CD-ROM of yesteryear. eDrive doesn't replace OS X's Recovery partition, it's just a supplement to it and it lets you use TechTool's repair features from the eDrive partition. 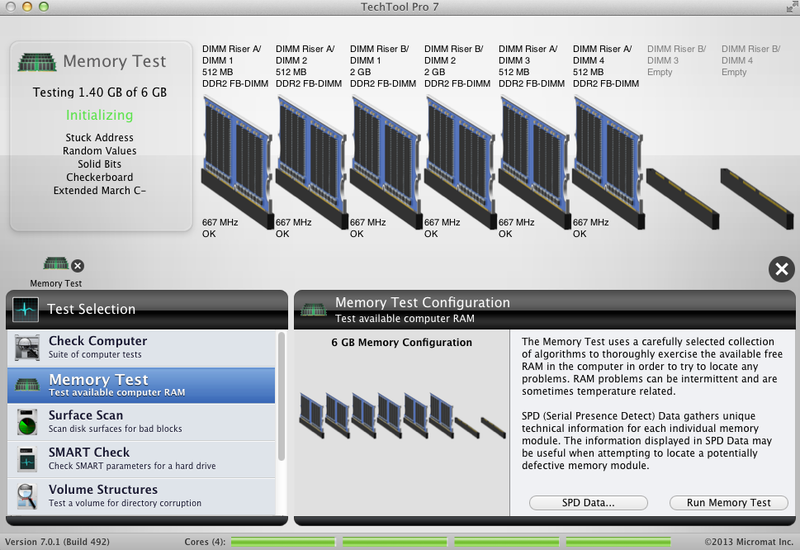 TechTool Pro 7.0.1 now includes a RAM module test called Memory Test. This, on its own, isn’t groundbreaking, but can definitely come in handy somewhere down the line, as RAM-related problems tend to be incredibly intermittent, causing a wide range of errors and even temperature fluctuations. The test, which gathers Serial Presence Data, does a full analysis of your installed RAM modules, then informs you as to whether the module passed or failed inspection and by what degree. Yes, there are freeware and shareware programs that do this, but it’s nice to see Micromat include this in the TechTool Pro suite. 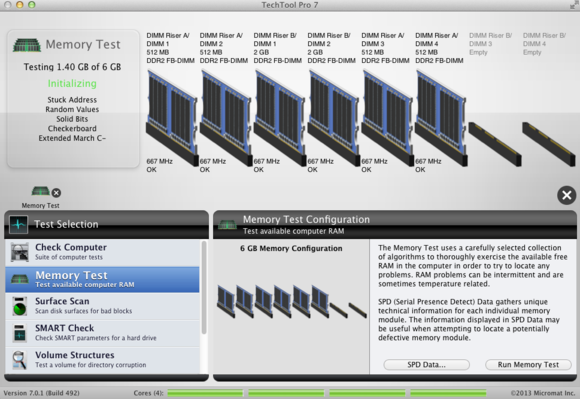 The Memory Test tool provides full feedback as to all of your installed RAM chips. TechTool Pro users have long demanded a full set of scheduling tools to perform automated functions. And while the dream of pre-scheduled scans and optimizations has yet to come true, the program has gotten closer to this goal. The features offered via its TechTool Protection Preferences pane now include backing data up to multiple drives, S.M.A.R.T. monitoring for hard drives, Trash History configuration that remembers deleted file information for recovery, and hard drive failure warnings via email. 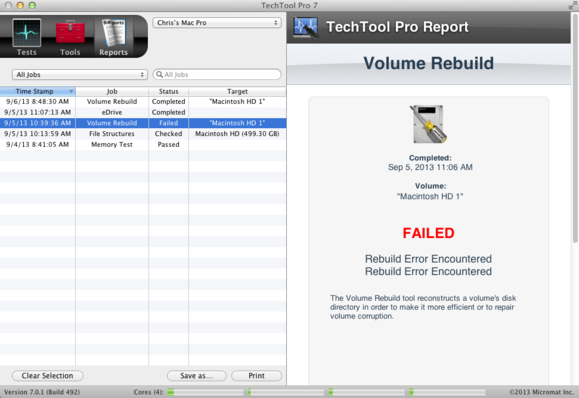 The features might not be quite what a die-hard techie would go for, but given that TechTool Pro 7.0.1’s S.M.A.R.T. was able to sniff out a MacBook Pro’s failing hard drive prior to its absolute demise during testing and allowed for its data to be recovered and swapped to a new hard drive, it still holds its own. Although TechTool Pro 7.0.1 boasts a strong array of tools and features, there are some caveats to consider. At this point in time, TechTool Pro seems to offer no cloud-based backup features, which are becoming something of a de facto standard in the days of iCloud, Dropbox, SkyDrive and other services. Such a feature could only help the product and it’d be nice to know that your data could be readily backed up to multiple hard drives as well as remote locations if need be. Finally, the program experienced a kernel panic during the optimization of an external hard drive during testing, though this only happened once and the issue proved to be non-recurring. A full log of test reports lets you know what components failed at what times. There’s still some features to add to the scheduling tools and it’d be nice to also back data up to a remote location, but TechTool Pro 7.0.1’s tools are powerful and have grown well over the versions. It’s nice to see more component-specific tests (such as scans for dead display pixels and failing RAM chips) alongside standard hard drive repair and optimization utilities. The new version isn’t revolutionary, but a solid step in the right direction and can help repair or avert the next upcoming crisis, whenever it may come. Version 7 isn't a revolutionary change in what TechTool Pro does, but it is still a comprehensive set of troubleshooting tools for your Mac.